The Glasshouse in Pomona is an all ages venue that has grown a strong reputation for holding some of the most exciting indie punk rock shows. Tijuana Panthers can now be added to that long list, as they played a fun and energetic set on Valentine’s Day. Upon entrance to the venue, a small Valentine’s Day display could be seen with a long line of attendees waiting to get their picture taken in front of it. The actual concert hall was cleverly decorated by the fine folks of Viva Pomona in a Valentine’s Day theme that made the floor closely resemble that of a high school dance. Those in attendance were anxiously becoming restless when the trio from Long Beach, CA graced the stage. They quickly ripped straight into what appeared to be a new song, with drummer/singer Phil Shaheen impressively singing while playing a fast tempo. As soon as the song ended bassist/singer Dan Michicoff began to play the opening bass line to “Bainbridge”. The aforementioned song began an endless trail of crowd surfing and maintained for the majority of the band’s surf rock inspired punk songs. Guitarist/singer Chad Wachtel took a brief moment to recognize how “wild it was out there”, then jokingly asked a few hecklers to stop calling for “Preacher”. He did reassure them that the song would eventually be played, before playing “Tony’s Song”. During this song, a bra was mysteriously thrown onto stage, Dan acknowledged the article of clothing by pointing it out to Wachtel saying, “Chad, this is an all ages show here!”. Wachtel responded with “Someone’s dad is not going to be happy”, following it perfectly with the song “Father Figure”. “Summer Fun”, “Cherry St.” and “Redheaded Girl” kept the energy at a high level. At this point of the set Tijuana Panthers could be seen in fine form, randomly falling into short jam sessions. Michicoff could be seen jerking his bass around stage, while Wachtel calmly strummed through chords, with Shaheen providing the constant rhythm, crashing cymbals included. The majority of the floor was engulfed with bouncing bodies, some dancing freely and others just looking to bump into one another. The band surprisingly introduced and played a handful of new songs, amongst their older tunes from Max Baker and last year’s Semi Sweet. Their set ended with “Prayer Needs” and the crowd began to chant “One More Song!” as the band exited the stage. Wachtel briefly explained how special it was to play The Glasshouse, citing it as “one of the venues we frequented the most growing up.” Then playing a two song encore which included “Fried” and “This Town”. The evening was a very special one, an experience to share with a special someone (or not), with a truly unique and special band in Tijuana Panthers. 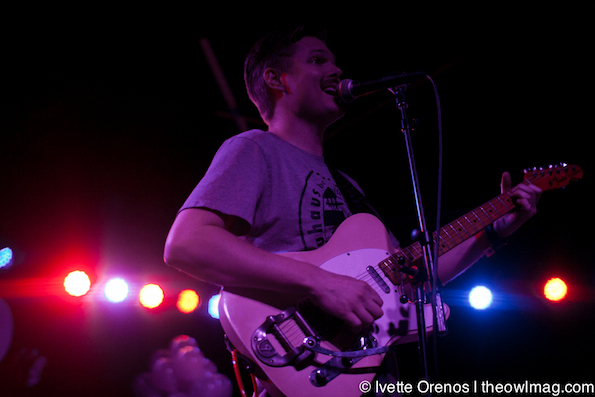 Check out more photos of Tijuana Panthers charming Pomona for Valentine’s Day HERE!